A vigorous evergreen reaching 7 m (23') displaying small purplish white male and female flowers on the same plant, followed by purple fruit. The fleshy sausage shaped fruit is rarely produced unless planted against a sunny wall. 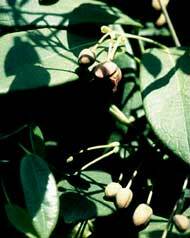 Holboellia is usually grown for its attractive evergreen foliage. Also known as China Blue Vine.